What is your process for designing a cover? The first thing I always ask is your goal and how that applies to your needs for a designer. Are you looking for the best way to market your book – which may or may not coincide with the ideas you already have for the cover? This is more of a marketing approach. Alternatively, are you looking for an artist to bring YOUR vision to life – whether it’s a scene or a character, etc? In the second case, we can discuss potential scenes/characters and I get to work. In the first case, I take you through my process of looking what is on the market so we can both kick around ideas of what will best represent the book to the audience already reading that genre and how to best convey the most marketable aspects. In this case, I usually ask for a “starting point” in form of a cover art questionnaire after which we can discuss the artistic direction. If and when the ideas and price (price info below) looks good to you, I ask for a 50% deposit before starting work and once that goes through, I will have the concept art to you within ten business days. My approach to covers is “go big or go home” – focusing on maximizing the book’s marketing hooks to catch the interest of the target reader group and make the tiny Amazon thumbnail pop from the rest. I ask for a 50% deposit to start on your cover, and once that goes through, I will create a concept design within ten business days. Once the concept artwork is approved, I will send an invoice for the rest of the payment and when that goes through, you will receive a high resolution version of your cover, ten versions of your cover optimized and labeled for top ebook content vendors, a title graphic (without the artwork, to be used on your title page) and a bonus Audio sized book cover. What is your revision/refund policy? The purpose of the questionnaire is to make sure you aren’t surprised by what you’re getting. However, in some cases, an author and artist may not click creatively. If I deliver a mockup based on the agreed upon idea but the artwork isn’t meeting your expectations, I will return your deposit. Note: this only applies to the first concept artwork (before any revisions are done). If you are happy with the mockup but need to see a few tweaks, you get a number of revision included in the price of your chosen packages. (One round of revisions can mean multiple requests – as long as they don’t require a complete rework of the concept). Additional revisions can incur extra costs, and are usually not necessary (and are rare). My turn around time for initial concept artwork is about ten business days after the deposit invoice goes through. Can I purchase an ebook cover now and later ask you to create a print cover for the book? Yes, absolutely! I often advise my clients to do just that. They can get the e-book on the market quickly and then take care of the page count and other logistics to get their print book in order. Plus a new print release is another opportunity to market! Do you provide banners or buttons in addition to covers? Absolutely! See our digital promo pack for all the things we can do with your cover to help you promote your book. What is included in the cover art package? All my cover art packages include ten size versions of your front cover sized and labeled for the common e-book retailers. You will also receive a bonus title graphic for the title page of your book and a square version of your cover suitable for Audible should you choose to go the Audio round. Yes! All new clients get a $25 New Client discount. Series books receive a $25 series discount after the initial (first book) look and feel is established. You may also get some surprise deals if you meet me at publishing conventions and attend any of my workshops. Drop me a note using the form in the “contact” page and we can talk about what your needs are! 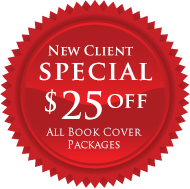 Ready to get started on your book cover? You can see prices and packages on the Services page, or simply drop us a note so we can chat about your book.